Operating briefly from Quadra Island which is located off the coast of British Columbia, between the mainland and Vancouver Island was quite a shock. On 20 meters in Europe there are always large signals to listen to. 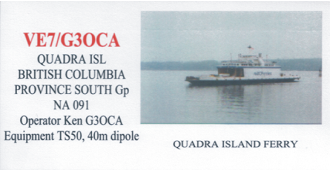 But in Quadra I only heard two signals both from the west coast of the United States. The bands being quite noisy the local operators said they had not heard a European station for some months. 40 meters was a little better with some U.S. and Canadian signals which were workable. I also was able to make contact with two PY (Brazil) and a AH6 (Hawaii) station. Only running around 100 watts and a wire dipole at least I gave several operators a new Island. The antenna was hung across the back of a building, hardly an ideal situation? but I worked all that I could hear. I only had time to do two days of operating as it was a holiday not a dx-pedition at least the few contacts made taking the radio equipment all worthwhile. My thanks to the owners of Roseland Cottage for their forbearance at the activities of a mad radio operator. Quadra Island, largest and most populous of the Discovery Islands, lies between Vancouver Island and the mainland coast of British Columbia, off Canada's west coast. It is home to 2500 year round residents and is a popular destination for visitors from around the world. Campbell River on Vancouver Island is the closest large community (35,000 residents) and port of departure for the 10 minute regular ferry to Quadra Island. Surrounded by breathtaking wilderness scenery and blessed with a mild temperate climate Quadra Island is a healthy and vibrant community which to live in or visit. Visitors have long been attracted to the island for its natural beauty, unlimited recreation and friendly people. Sportfishing has been and remains one of the prime attractions. More recently Quadra is becoming one of the premier destinations in British Columbia for adventure recreation and in particular for diving and sea kayaking. The intricate shoreline is ideal for exploration by sea kayak dotted with beaches, sheltered coves, protected channels and islets. The rich waters fed by large tidal exchanges nourish abundant marine life and are world reknowned for their diving. An artificial reef, HMCS Columbia, is also a local diving attraction. Rolling forested hills are criss crossed with over 200 km of hiking trails and mountain bikers have countless backroads and tarils to ride. The nearby inlets provide access to the vast Coast Range, one of the world's greatest mountain wilderness areas. Quadra's people enjoy a rural lifestyle surrounded by breathtaking coastal scenery and a clean unspoilt environment. The First Nations residents and global migrants together create a harmonious community rich in art and culture. The diversity of people, professions, lifestyles and pastimes is what makes Quadra Island a truly great place to live or visit.